Earth's Internet & Natural Networking: Are Rainforests Alone Solely Responsible For Earth's Climate Mechanisms ? "Loss of Tropical Forests Reduces Rainfall"
"The findings have potentially devastating impacts for people living in and near the Amazon and Congo forests." "Could removing vegetation really effect climate by decreasing rainfall ?" Which leads to other questions like, "How do trees/Shrubs influence cloud formation and rainfall ?" So the disappearance of vegetation has a dramatic effect on climate. So now research has been pursued to find out just exactly how the global climate, cloud formation and rainfall actually work. Suddenly now it just wasn't a simple matter of, "Well the Sun must heat up oceans causing water to evaporate, forming clouds which bundle themselves together into storm formation patterns and then proceed to dump their heavy cargo of water over land masses such as continents." This would be the average person's understanding or take of what makes for seasonal weather patterns. Of course they may have gotten this myth from previously held beliefs by Scientists decades ago who themselves didn't fully understand Earth's incredible biological inter-connectedness with physical laws and the roles they play in life sustaining weather mechanisms. 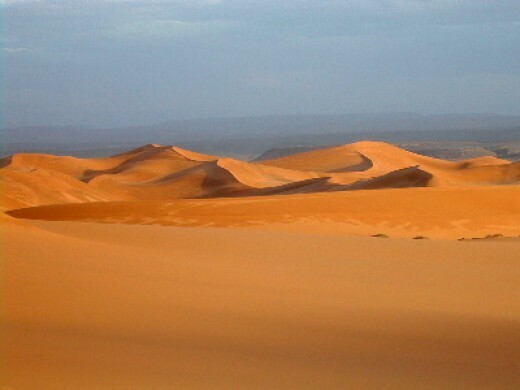 If it were really just that easy and simple, then the Sahara would not be what it is today. There are vast areas that never receive any rain. Even the Biological Soil Crusts have a hard time existing there or they are absent altogether in many places. What is amazing about their absence is the fact that these tough Bio-Crusts can exist in almost any seemingly inhospitable environment which includes the humidity starved Arctic & Antarctic regions at the Poles. The problem is like other lifeforms, they need a measure of water no matter how slight in order to survive. But there was also another article the a friend of mine pointed out yesterday that had to do with Fungi contribution to rainfall. I know, it sounds unusual, but not at all far fetched. As I've tried to illustrate here with this "Earth's Internet" blog, everything in our natural world is marvelously constructed to work and cooperate together. 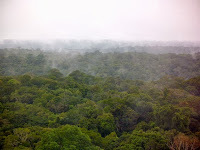 In the Amazon rain forest, it has been found that salty particles from spore-launching fungi help make clouds and rain. The tiny, potassium-rich specks, smaller than bacteria, waft above the forest into the air. Once in the atmosphere, organic gases condense on the particles, coating them with gel-like compounds. The coated particles provide a surface for water vapor to form cloud droplets and rain. I'll get to some points in a moment, but first here is a link to the article and some excellent quotes which at least shows they are on the right track with some of their research. "How Fungi Create the Amazon’s Clouds"
"The 1.4 billion of acres of thriving, sprawling biology that cover the Amazon help drive the very metabolism of a continent." Yes indeed. And every other plant community ecosystem around planet Earth does the same thing for it's surrounding land mass environments. This is not just a tropical rainforest phenomena. "Clear-cut the land and you could, in effect, clear-cut the sky." Wow, is it really possible Scientists are actually getting a clue here ? But then is it too late to do anything about it ? "That improbable idea comes courtesy of a paper just released in the journal Science, the product of work done by researchers at the Max Planck Institute of Chemistry in Mainz, Germany." 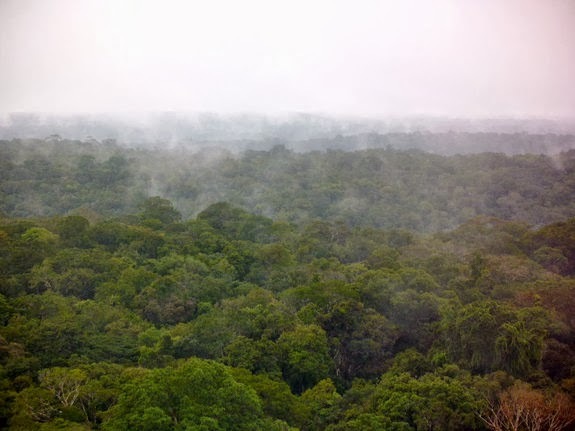 "How Salt in the Rainforest Becomes Clouds"
"In forested areas, the carbon compounds are byproducts of plants’ metabolism; in populated areas, they are often from human pollution." Sure enough, in Southern California (greater Los Angeles area & San Diego) much of that hazy weather which tends to make want to squint a lot outside unless you have sunglasses, is nothing more than the gaseous aerosols from pollution mixed with the natural coastal marine influence. Take a drive up to the mountains and these areas have normally baby blue skies. "What the researchers found was a mix of carbon compounds, plus one other thing: potassium — and that told them a lot." And not just potassium salts, but also other aerosols like Isoprenes, Monoprenes, Terpenes, etc which may be google along with the term 'cloud formation' and countless studies pop up to reveal these things have been known for some time now. "Forest fires often release the element into the air, but there were none burning when Pohlker took the samples. “Since we can rule out the burning source in our samples,” he says, “the other source seemed to be the biosphere itself.” In other words, the forest." "Even when that’s done, it’s not clear everyone will be sold on the new findings — or at least on their thoroughness." Of course not. That's why we have Big Business and the bad science that drives their debased ideas on geoengineering and weather modification (throw GMOs in there as well). These things make for quick profits for owners of these companies and their impatient investors who don't want these technologies researched to wait and see if it's safe or not for the environment. 1 -"Where are they doing this and how do they know such things can be manipulated ?" 2 - "Where in nature have they observed such phenomena and why are they manipulating and intensifying such frequencies to play with the global weather patterns ?" 3 - "Why are they not instead actually replicating nature by rebuilding the environment the way it was originally ?" There are countless other questions which an individual should ask and some of these I have dealt with in the past, though most readers here may not know of them if you have not checked out my pages on the right hand side of this blog. These pages don't go through the regular feed. All in all I liked the article, though I may disagree with some things. I like the fungal connections to trees observation. Whether or not they give off these compounds or not, these elements never the less come from a healthy pristine forest and they moderate climate through cloud formation and rainfall. The sad thing is such information as pointed out in this article will either be shelved or given some temporary funding for what is termed a "Pilot Program" somewhere. There will be much cheering, congratz, high-fives, backslapping and awards given, but most likely there will never be a massive wholesale application of intensive restoration around the globe as there should be. The planet is loaded with well meaning & the good intentions of ecology "Pilot Programs" but we still have problems. Unless these solutions make or guarantee somebody/s a lot of money, then interest will always be lacking. I fully understand the economics side, but seriously, some things should be done because it's the right thing to do. "Clear-cutting the land and you could, in effect, clear-cut the sky." "Trees Recharge Earth's Electromagnetic Field ? ????????? - Yes!" "Earth's Vegatation Effects Global Cloud Formations"
"Earth's Internet: Electrical Conductivity of Trees"
The 1996 arson set Wildfire destroyed all old growth trees and chaparral on the north & west sides of Cahuilla Mountain on the western end of Anza Valley and completely burned off on the top of the mountain. The previous organized cloud forming phenomena which took place faithfully year after year during the monsoon season which was in no way random in it's observed mechanized formation ceased to function after that event. Myself and several friends noticed this phenomena as far back as back in the early 1980s. One of my best examples of plant community weather influence is the Chaparral Community. For twenty four years I lived in Anza California and watched every summer's monsoonal flow weather phenomena coming in from the direction of Coyote Canyon to the southeast from Mexico. I'm a little hesitant to go into this very much now as I actually have a deeper draft in this blog's back-office, because I need to photo and document some things first. Back then there were no digital cameras and there was no interest on my part for writing about them other than personal interest and practical application. But in brief, there were three main geographical areas which facilitated cloud formation and Thunderstorm development better and or more often than other areas in and around Anza. One area was called Cahuilla Mountain, another the large land area is located at the southern end boundary of Cahuilla Indian Reservation towards the Buck Snort Mountains & Beauty Peak. The third is an area between Paradise corners jct of Hwys 371/74 east towards Santa Rosa Indian Reservation with Lookout Mountain in the middle. For the first several years I wondered if it was a matter of geographical structure. Moisture pushing up from Mexico being uplifted at these locations, meeting colder air and creating clouds. Unfortunately this could only be said of Cahuilla Mountain and not the other two. The area of southern Cahuilla Indian Reservation are mere foothill steppes leading up higher points. To make this story short there was one component that was identical and all three had in common. None of these three areas had much development or vegetation removal. Most of the vegetation while there was some trees, were predominantly old growth Chaparral. I had always noticed on the morning of a rain event that day when there was only blue skies and no clouds, there was always the moist heavy scent or fragrance of Chaparral aerosols hanging in the air. Mostly these were Creosote Brush coming in from the Borrego Desert floors, or Redshank/Ribbonwood chaparral. If I didn't experience this phenomena then rain was for the most part unlikely. I'm going to leave it there as I have more details coming in the other post. But anyone can Google for themselves almost any plant, shrub or tree and find info on aerosol releases or other phenomena such as their abilities at Hydraulic Life, Redistribution or Descent. Believe it or not there are some researchers out there that have already done the hard work on this and yet you will never find such terms in most land rehabilitation programs or projects. Seriously when you apply all of this together, it makes for greater understanding of how the biological machinery actually functions and what steps you must take in calculating just what you need to do in rebuilding it. To REPEAT here, the conventional science makes no mention of any of this in the literature. It apparently gets filed away under phenomena of passive interest and never truly sees the light of day for the true value of what it really is. Here's another examples of the connection between Temperate forest and/or grassland vegetation and their effects on cloud formation and eventual rainfall water cycling. Presumably fewer clouds over the grassland prairies will mean less rainfall. The increase in Carbon Dioxide in the atmosphere causes an evaporation decrease in plants. More sunlight will reach the ground as opposed to this energy being absorbed by clouds. Please read the interesting article below. "More CO2 leads to less Clouds"
"A new feedback mechanism operating between vegetation and cloud formation could enhance the climate change"
The plants are an important source for lower elevation dew point close to the ground for which successful rainfall events may occur allowing fresh water cycling to saturate the Earth below. This brings me to the meteorological term called Virga which is an observable streaking or shafting of rainfall underneath what appears to be a well defined Thunderhead. But the rainfall never hits the earth. The reason is that in the higher altitudes water content is frozen as ice crystals before melting into water and eventually evaporating before hitting the Earth as a result of drier lower elevation compressional heating, as air pressure increases closer to the ground. Higher dew point humidity means rainfall has better potential for reaching the ground. You will often hear this explained to you on local TV News weather reports. Again this is most common in Deserts and Temperate regions. Most often these beautiful scenes like the photo above will be seen around late afternoon and sunset. Although I have seen them at around 4:00-5:00 am in the deserts near the Salton Sea. 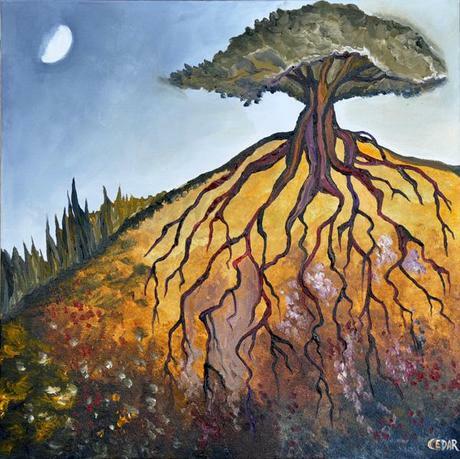 Still it does illustrate the importance of the healthier older growth vegetation connections to deep water sources within the Earth itself through deep complex root system structure and their mycorrhizal connections with other plants. Releasing of water through transpiration & aerosol releases facilitates the entire productive rainfall event. Take the vegetation away and you have fewer chances of proper climate rainfall averages. This has been going on for decades, but the difference now is that as opposed to destruction of a localized geographical water cycling phenomena, the entire planet hydrological cycle system is breaking down. Of course there is always that matter of electric discharge by vegetation into the atmosphere. During monsoonal moisture flows and cloud formation, there is a stronger positive charge to the atmosphere above and negative grounding in the Earth. Plants offer a connection to this two forces. The extreme or heavier rain is usually closest to the direct location of lightning strikes. Let's illustrate it this way. Neon lights work on the principal of electrically charged gases, particularly Argon Gas which lights up at the presence from both ends of the Bulbs tubing of a positive and negative charge which lights up the particles. Clearly the gas particles are a conduit. Though the gases or aerosols given off by plants are not of the same composition, there must clearly be an electrical conductivity component which works within the microscopic particles and moisture given off by the plants that allows for this cloud formation and rainfall. Once again you never find all of these factors together being spoken about with regards this subject, but it should be. The weather modifying equipment prove they understand the concept very well. 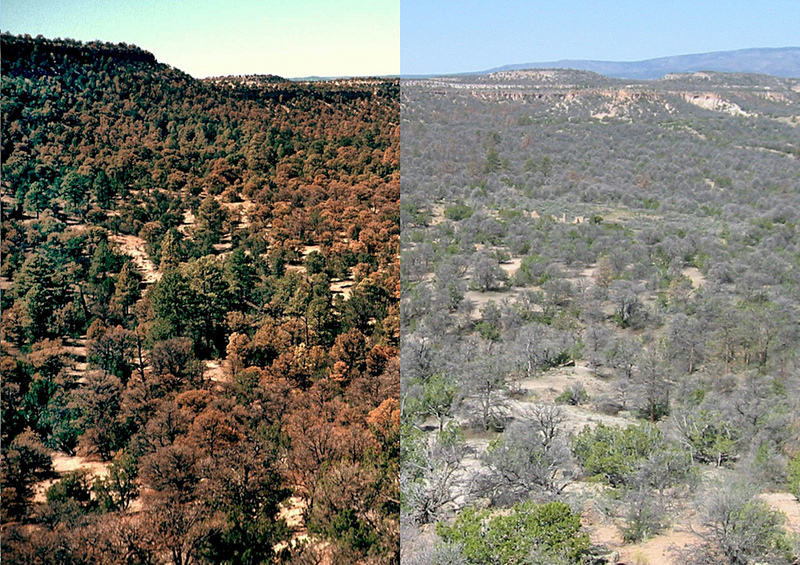 This Pinyon Pine forest that is near Los Alamos New Mexico have begun to turn brown from drought stress in the left side image which was taken in 2002. The other photo taken in 2004 from the same vantage point shows the Pinyon Pines largely dead. These plants normally absorb CO2 from the atmosphere, but clearly with changes to the atmosphere today with it's higher than normal CO2 content, there is a shutting down of this water & aerosol combination release which also hinders many components of the cloud formation for which water vapor from the summer monsoonal flow is able to form around these micro-particles which aid in cloud formation. The summertime tropical monsoonal flow events streaming up from Mexico still make their way north, but if the mechanisms below are disrupted in anyway, then the normal pattern of rainfall changes or ceases altogether in many areas. Today's problem is that these areas are widening geographical encompassing greater and greater regions. Eventually we have a runaway train domino effect. In desperation, most government scientists ALL know this, yet their answer is some of the usual irresponsible conventional science which offers only a quick fix-it-pill approach. Not to mention, it almost always has to make someone money and this is where horrible programs of the bad science of Geo-engineering and Weather Modification come in. These are clearing not viable answers, but they won't even attempt to repair the damaged natural machinery which has been dismantled out in nature around our globe. Watching all the stupid political infighting among leaders at these wasteful climate summits makes one realize things will never change. Bookmark this and keep watching for further info. As a parting note, Mike Amaranthus of Mycorrhizal Applications Inc has a latest Video on their Natural World biotechnology with regards to "The Green Economy" and replicating nature which is something mainstream conventional Government Mandated Science has ignored for the most part.Here is a link to the Mycorrhizal Applications Inc You-Tube page with a wealth of educational video material. Well here's the superstitious storytelling Shaman version of cloud formation and rainfall given to gullible ignorant tribesmen sitting around a camp fire. Very deep deep write. 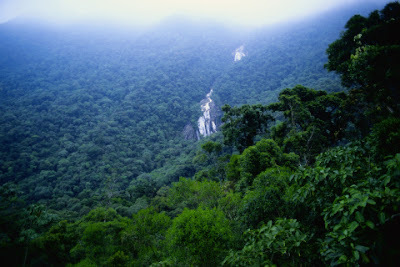 Of which I can respond that I have seen the rain forest breathe...the Evapotranspiration was in full gear early one morning. It was at that point I discovered the forest was alive and also a force in creating clouds. I wish people could witness this all to understand our world better. It changed me for the better. Excellent write. What is amazing proof that they understand many of the deeper things of how a combination of mechanisms work is that they have created inventions for weather manipulation. 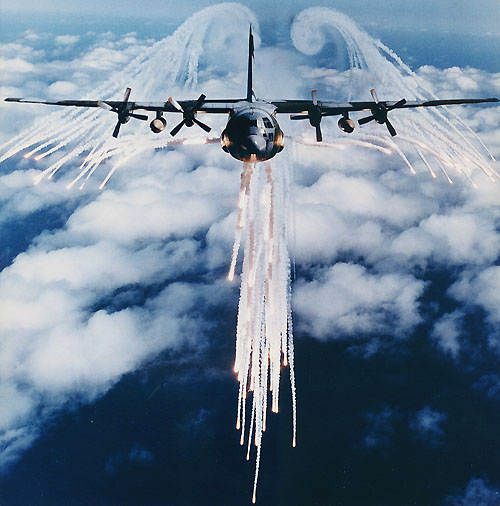 The USA Air Force's HAARP program was initially designed as a possible weapon of war to manipulate weather on a battlefield against the enemy or to create clouds or fog to hide their own troops. To me while I find such plans not surprising , they are also sick. The countries of China and Russia I know for sure are doing the same thing. The problem is the natural world is in such a messed up state now that these devices are being used to create and overload storm systems. Natural and normal patterns are not happening as they once did. But rather than replant and rebuild natural systems, they opt for a form of death technology. These countries all know what is happening though they won't admit it publically. They fight at these climate summits over rights to run their economies as they see fit. Curbing industry they feel would slam on the breaks of any growing economy which would create terrible civil unrest and they opt for doing what they've been doing for the past 100 years. If you've ever seen some of the stupid plans they have for geo-engineering , you'd realize how ludicrous and science fiction it all is. The only thing I hope is that as individuals here, landscapers, farmers and the common gardener which be help to replicate a simpler system of doing things that will benefit them personally and spread to others. I'm fascinated by the fact that many of the developing nations are most of my visitors here. I hope they take some things away and use it or improve on it. I feel the same way with my garden here. We can't change the world but make a difference in our small little areas. But seeing that "breathing" in the Amazon really opened my eyes. I did a post a long time ago http://gardeningandthespanishway-rohrerbot.blogspot.com/2010/07/zone-crazy-peru-part-1-amazon.html and on the very last pictures, you'll see what I saw that morning. It really changed my attitudes about how interconnected everything is...and when we humans screw around with these ecosystems, we are dooming our future generations. But why should we care right? We won't live to see the destruction.....just our children and their children. So irresponsible on our parts and very selfish. 29 "In those days they do not say any more: Fathers have eaten unripe fruit, And the sons' teeth are blunted." It's a bit of an odd saying. How could a Father's eating of unripe acidic sour grapes cause the children's teeth to be blunted or dulled ? Some translations say makes children's mouth pucker up from the sourness. The Israelite's knew the Mosaic Law's mention recorded in Exodus where it was said that God would bring punishment for error for sins (wrong or bad conduct or life choices) on the second third and fourth generations. For the Isrealites that eventuality came when Babylon destroyed Jerusalem and carried that last generation captive as slaves. Believe or not, some of that punishment came as a result of their not taking care of the land properly and pursuing nothing but profit as a result of abusing it. The old saying and quote is also found at Ezekiel 18:2 , other cross references give similar reads like Lamentations 5:7 which reads this way. and now we’re paying for the wrongs they did." The first time I saw that quote it was believe it or not at the top of a Scientific Research Paper dealing with Epigenetic or Genomic Imprinting inheritance. The paper dealt with a true to life bad choices humans make or the negative environmental experiences in one's life at a young age and the genetic inherited effects many generations later to descendants. I actually have a lengthy piece in my Timeless Environments blog on this very subject. The subject is fascinating and the accompanying documentary by modern geneticists proves this to be true. People living today are paying for the stupid ignorant choices their ancestors did centuries ago and modern mankind's bad ideas (which includes Bad Science) will have an effect on later generations, with the exception that environmental abuse today is sped up to the point of our ability to foresee life on this planet Earth right now is in question of being able to continue. Okay sorry for the rant.